What’s the NFL’s backup plan? 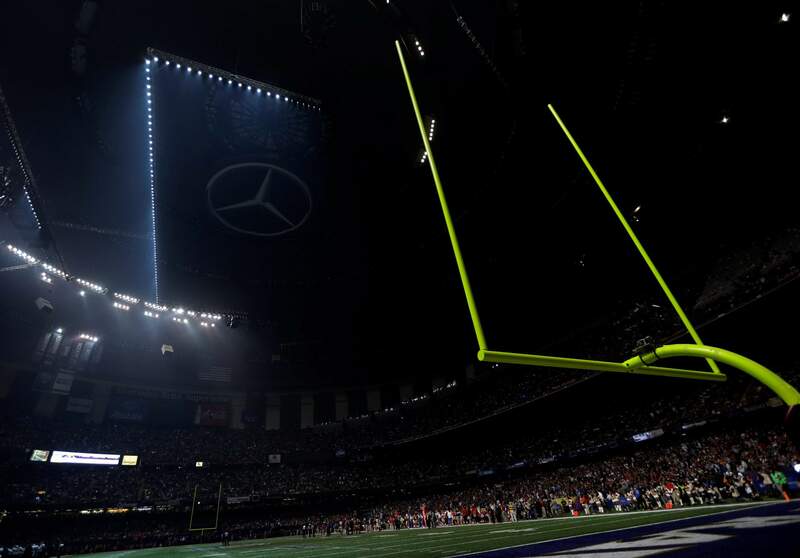 Superdome and utility officials still were trying to nail down the precise cause of the 34-minute Super Bowl delay, but league officials said that, because of the backup power system, the game wasnt in danger of being postponed. NFL officials were sure theyd get the Super Bowl finished Sunday night. And if they couldnt, the league championship still would not have ended where it temporarily stopped, with less than two minutes gone in the third quarter. The Lombardi Trophy goes to the winner after 60 minutes, not 32. Commissioner Roger Goodell said Monday the Superdome had a backup power system which was about to be used during the Super Bowls electrical outage. It wasnt needed because power started coming back at that time, he said. Superdome and utility officials still were trying to nail down the precise cause of the 34-minute Super Bowl delay, but league officials said that, because of the backup system, the game wasnt in danger of being postponed. Goodell was sitting with New Jersey Gov. Chris Christie during the game. The Meadowlands will host next years Super Bowl. Grubman said Goodell has the sole authority to enforce any contingency plans and was in perfect position to do so Sunday night. While declining to be specific, Grubman said the league has backup plans for continuing the game. Those plans all focus on playing the full 60 minutes, regardless of whether it is the same day or on another day. So the Ravens, ahead 28-6 at the time of the partial blackout, wouldnt have simply been declared the winners. This isnt baseball, where half a game is considered official. In the end, Baltimore still won, beating San Francisco 34-31. The momentum shifted tremendously after the lights went back on, however, with the 49ers rallying to make it 31-29 at one point in the fourth quarter, and missing a 2-point conversion pass that would have tied it. Having to replay  or finish  the Super Bowl on another day clearly would have been a major headache for the NFL. The Super Bowl invariably is the highest-rated television show of the year. Playing it any other time but Sunday evening would create trouble for the networks. There also are travel and hotel considerations because the game is played at a neutral site, attracting thousands of visitors to the host city. Most importantly, there are health and safety concerns. Making teams play a Thursday night game after one on Sunday has been criticized heavily by the players union. A quick turnaround, such as finishing the Super Bowl on Monday, could be dangerous. Plus, there are competitive balance decisions to weigh. What might be fair to one team could be a hindrance for another. Several major sports, including the NFL, have dealt with emergencies that forced schedule changes. Just last year, the Daytona 500 was moved from Sunday afternoon to Monday night because of rain. But NASCAR often is forced to move races due to bad weather. Same with golf tournaments, and if the USGAs major events are not won on Sunday, they end the next day with an 18-hole playoff. Baseball, of course, is vulnerable to rainouts, too. In the 2008 World Series, Game 5 at Philadelphia was stopped in the sixth inning because of rain with the Phillies and Tampa Bay tied at 2. The storms stuck around, and when play resumed two days later, the Phillies won the game and clinched the championship. In the 1989 World Series, an earthquake rattled Candlestick Park minutes before the San Francisco Giants were set to host Oakland in Game 3. The Series resumed 10 days later, and the Athletics won twice to complete a sweep. In 1988, the NHL dealt with a blackout very similar to what happened in the Superdome on Sunday night. Game 4 of the Stanley Cup finals between the Bruins and Oilers in Boston was tied 3-3 in the second period. Edmonton led the series 3-0. A power outage eventually forced cancellation of the game, and the teams headed back to Edmonton for the next game, as previously scheduled. The Oilers completed their sweep 6-3 at home. The other matchup that compares to the Super Bowl is the World Cup final at the end of the monthlong soccer tournament. FIFA has provisions for a replay, but in the era of penalty-kick shootouts, that wont happen  unless there are extenuating circumstances. Such as a power failure. So FIFA demands that local organizers ensure that every stadium has an emergency independent power generator. The NFL requires its stadiums to comply with all applicable local building codes and laws, which normally require the kind of backup system the Superdome has. AP Sports Writers Ben Walker and Ronald Blum in New York contributed to this story.